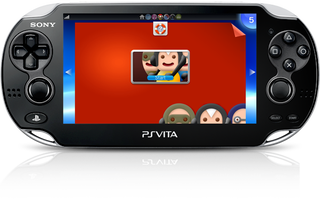 The PS VITA HAS CROSSGAME VOICE CHAT! I only found out about this a few weeks ago when Botcher and I wanted to chat but I had no microphone for my PC. So he tried the Party app on the VITA and bam! He was in the PS Store and I was playing Dynasty Warriors. Just talking about stuff. I had never known this nor had I tried it before I just filed it away in a folder. This last night with the release of Soul Sacrifice on The PS VITA being Free for PlayStation Plus Subscribers. Me and Snak The Doge Enthusiast who I will now call Snak for the remainder of this were communicating while playing soul Sacrifices online missions or Avalon Pacts. I was able to answer any of Snak's questions as playing Soul sacrifice will bring up many like enemy weakness, How to get more ranking points, and what to watch out for. It's easier to do through voice chat than through the preset phrases that are programmed into the game. Don't even get me started about trying to use that damn VITA touch screen keyboard! We played for a good 2-3 hours before calling it a night. So if anyone is interested in VITA meet ups just add me Novibear on PSN and say you're from TAY and maybe some time since a lot of people are getting vacation we can have a little VITA party. What we had originally hoped for was for those of us who do not 3DS's for today's game night based on Pokémon X and Y the VITA users could get down in Soul Sacrifice. The issue is that Soul Sacrifice's lobbies are only a size of FOUR. However VITA's party can hold 8 people. So if anyone is interested please do contact me because having people to play the game with has rekindled my love for it. If you're a Playstation plus subber and you want in download Soul Sacrifice and all of the DLC including the Online Pass which should be bundled with the Online purchase of the game. The DLC's are mostly free. Most of them are additional mission and some are in game Special attacks. Also in order to get to the Networking mode you must complete the first chapter which introduces you to the world the Sorcerer's live in.